This one-dish meal is just about as easy as it gets. The slow cooker does the work while you are free to do other things. When it's ready, you have a balanced dinner all in one dish―meat and vegetables, including starchy vegetables. Serve with cornbread, corn muffins, French bread, or sourdough rolls for a hearty wintertime meal. Pair with a big red wine like cabernet sauvignon, Malbec, or zinfandel or a cabernet-merlot blend. Since you've sailed through the main dish, serve up a sweet dessert like apple pie or tart, cherry pie or yellow layer cake for a nice finish. This bean dish also makes a great option to take to a potluck supper or tailgate. And it's easy to feed a crowd by making a bigger recipe. In a large and heavy skillet, cook the ground beef, bacon, and onion until the onion is translucent, the bacon is cooked and the beef is well-browned. Drain fat from the meat mixture. Put the beef, bacon, and onion mixture, baked beans, kidney beans, lima beans, molasses, brown sugar, ketchup, and mustard into a slow cooker. Cover and cook on high for 1 hour. Reduce the heat to low and cook another 3 to 5 hours. Add the reserved juice from the baked beans as needed to thin the mixture throughout cooking. Substitute pork and beans for the baked beans in this recipe. Add butter, cannellini, pinto, navy, or great northern beans to the pot or a mixture of these. Add a dash of white wine or cider vinegar to the mixture. Omit the molasses and increase the brown sugar to 1 cup. Add chopped celery, as desired. Make a healthy vegetarian version and go meatless by omitting the ground beef and bacon and adding a different type of beans as a substitution. Substitute ground pork sausage for the bacon; brown with the ground beef and onion or make the sausage in addition to the bacon and ground beef. Use pork sausage as the only meat and season the pot with salsa and ​taco seasoning for a Mexican twist. 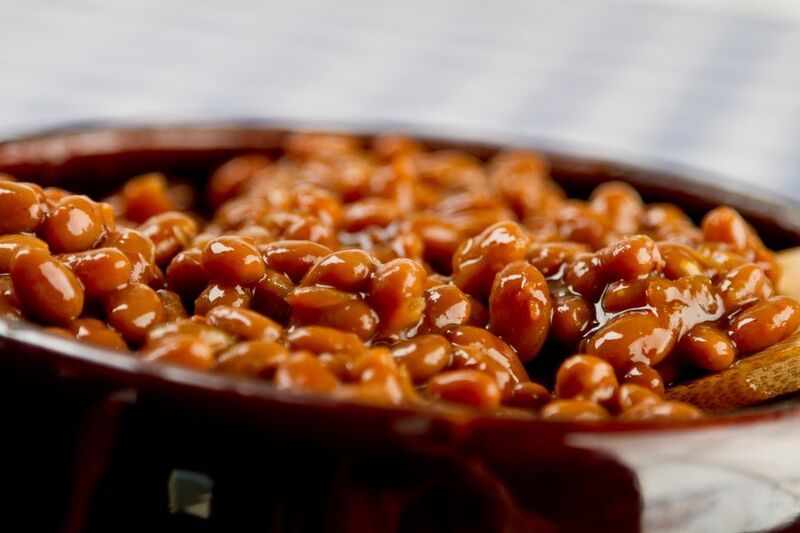 Use baked beans, kidney beans, black-eyed peas, and lima beans and omit the ketchup, mustard, molasses, and brown sugar.